More information: "Real-time imaging of density ducts between the plasmasphere and ionosphere" Geophys. Res. Lett., 42, DOI: 10.1002/2015GL063699. Plasma ropes are of course code for Birkeland currents. More and more data daily which continues to confirm the electric nature of our Universe. Give this young woman a doctorate. They aren't Birkeland currents. Read and try to understand the paper. 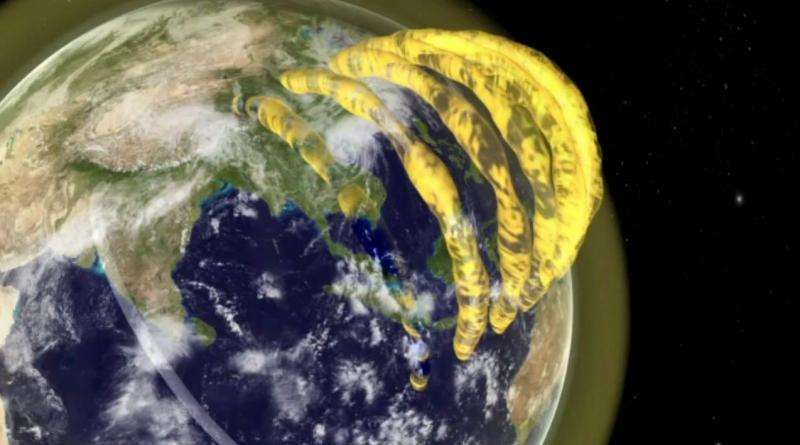 They are magnetic flux tubes of the Earth's internal magnetic field above the ionosphere, which are expected to be filled with magnetospheric plasma. Amazing how many times these EU numpties keep misinterpreting the real science to try to show support for their much derided pseudo-science. Since a Birkeland current is a field-directed current, and the magnetic field dives into the atmosphere at both ends, there should be some evidence of this current hitting the atmosphere. Permanent auroral displays at mid-latitude,for example. All cd has to do is provide evidence of this sort of thing happening. And while your at it get CD a life....so that he can stop calling every plasma tube formation a Birkeland current. I know, I have the problem of calling every duck a duck too. The duck comment suggest you have no evidence that there are currents in these things. Thanks for wasting our time. @ Jean-Skippette. How you are Chere? I am good today, thanks. Ol mark-Skippy got shown the door and locked behind him so he can't answer you until he gets a new puppet name. You suggested that, I didn't do such a thing. You're wasting your own time in making such a stupid comment. The "tube-like" structure is enough to show there is a current present, if you had the slightest inkling of understanding of plasma physics this would be obvious. Do we need to explain to you why ducks are called ducks as well? And due to your extreme ignorance of plasma physics, you should probably refrain from pontificating what you think "should" be evidence. To that point, we know that the polar BC's are always there, strangely there is no permanent polar aural displays are there. How can that be? Once again, if you had a clue, you'd understand it had something to do with current density. Please excuse my ignorance, but what are "polar BC's"? @ Jean-Skippette. They are polar bear cubs, cute little baby bears that are white and fuzzy. What you should be asking him about it is the foolishment with the electrical machinist digging out the Grand Canyon. Or is it the Grand Couyon? Yeah that would make more sense, grand couyon. Really? Would you please explain why, preferably with primary references? It's quite obvious, the only way to create the magnetic field which holds the tube together is to have a current flowing through it. If you need a paper to understand this, we'll go ahead and look it up yourself. There is plenty of literature discussing field aligned currents available. If you're going to argue against something you should at least have a basic understanding of the physics. Clearly none of the posters in this thread arguing against my comments have the slightest clue about the objects of the discussion. And you have the ability to answer your question. Unless of course you only rely on others to "teach" you. For example, "the only way to create the magnetic field which holds the tube together" - where is the DIRECT evidence that it is a magnetic field which "holds the tube together"? We're discussing plasma here, what else do you expect to drive these plasma properties? Magic? For example: "holds the tube together": where is the DIRECT evidence that the tubes are stable structures (in some long term)? How long do they need to exist to be real for you? How about long enough that they can be measured and "probed in 3D". Finally: "the *only* way to create ..." REALLY!?! How do you expect magnetic fields to be created? Ask your neighborhood electrical engineer, but avoid astrophysicists at all costs. They believe magnetic fields are magical. It's quite obvious, the only way to create the magnetic field which holds the tube together is to have a current flowing through it. If you need a paper to understand this, we'll go ahead and look it up yourself. Just totally wrong; those tubes follows geomagnetic lines. Charged particle in the ionosphere will naturally follow those lines. There is no need to maintain an electrical current to have a magnetic field; once a magnetic domain is created it can keep its state indefinitely. The Moon and Mars have remnant magnetism. The earth's field is induced by current generated by magmatic thermal convection. A similar answer was given by another new and excellent poster 'jonesdave'. Thank you! Your contribution is highly appreciated. Except, those charged particles following the "field lines" constitute an electric current, hence the plasma tubes. There is no need to maintain an electrical current to have a magnetic field; once a magnetic domain is created it can keep its state indefinitely. That is a completely asinine statement, and "just totally wrong"! Strangely enough, the machinery in my manufacturing business needs electricity to operate today even though there was a "magnetic domain" in operation yesterday. The Moon and Mars have remnant magnetism. Ferromagnetic properties of material exposed to electric currents. That is the theory, sadly completely unsupported by any laboratory evidence despite years of attempts. According to that nonsensical theory salt water in a blender should induce a magnetic field but once again complete fail. Electrons do not flow along those lines nor do they have a preferred polarity so no electric current. Electrons get in a perpendicular 'cyclotron motion' around those lines as if it would be flowing inside a coil and this, until positive ions intersects their paths; that is all there is to it. This answer tell me that you do not know what a magnetic domain is. In a nut shell, let's say that binary infotmation in your hard drive (if it is a mechanic drive) are stored in magnetic domains.